Giftapart ranked top 191 amongst wordwide companies. SOMERVILLE, NJ, August 31, 2018 — Giftapart Inc., the tech ecommerce startup in New Jersey that according to its CEO is “going to change the world and is creating a revolutionary new way for retailers to get, connect, and sell to a growing Gen Z and millennial shoppers,” reached the top 200 of worldwide companies on Crunchbase. At the time of this writing, Giftapart had the second highest rank of all New Jersey companies at 191, following Merck & Co., the worldwide pharmaceutical company, ranked 174. Crunchbase, founded in 2007, is a platform for finding business information about private and public companies, according to Wikipedia. The Crunchbase website states that it’s the leading destination for millions of users to discover industry trends, investments, and news about global companies — from startups to the Fortune 1000. Filipe Pedroso himself is ranked in the top 100 individuals on Crunchbase, currently at 93. “It had more meaning to me when I shared the same spot with Woz [Steve Wozniak]. For a day or so, we were literally tied [at 155], and it was kinda cool,” said Filipe Pedroso. Steve Wozniak, co-founder of Apple computer, and Filipe Pedroso shared the top 155 spot together on July 13. The company anticipates a capital raise after its launch. 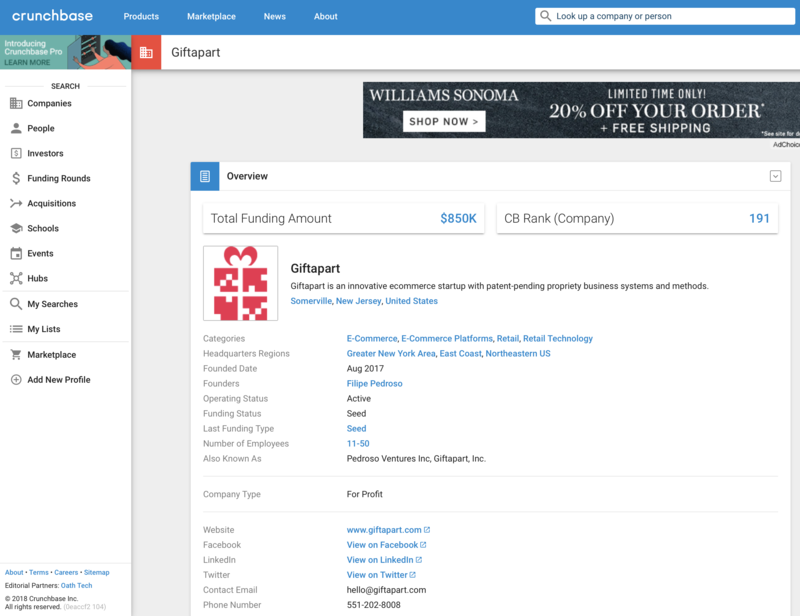 Giftapart recently received a second seed funding from one of its current investors at a pre-money valuation of $30 million USD. “We will consider a partnership with the right investment or institutional funding organization when the time is right,” said Filipe Pedroso. Institutional investors wishing to learn more about investing, can contact Giftapart at hello@giftapart.com. Text and pictures available at: https://info.giftapart.com/news/news20180831.html.